In the words of Oprah Winfrey, “what I know for sure” is that you can make what seems to be the impossible dream a reality. For several years I have wanted to write a book. As an avid reader and a collector of beautiful coffee table books I knew that becoming an author was written in the stars for me. The thought of writing was big and daunting but I knew that whatever I was going to write would be an homage to the women who have inspired my journey as a fashion stylist and enhanced my creativity on so many levels. I wanted to share all of the wonderful things I’ve experienced and learned while dressing curves. On April 19, 2016 my first book The Art of Dressing Curves: The Best-Kept Secrets of a Fashion Stylist (Harper Collins) will officially be on sale and I couldn’t be more excited. I have written an empowering and celebratory style book for curvy women. It is a contemporary guide to getting dressed–from shapewear to accessories—and building a classic wardrobe closet. I am encouraging women to enjoy fashion at every size. 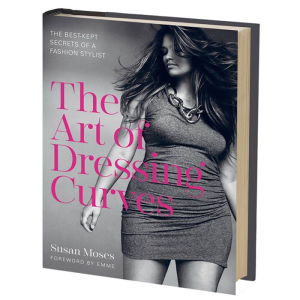 The Art of Dressing Curves is filled with gorgeous high-fashion photography featuring the industry’s most visible curvy models, celebrities and inspiring quotes from creative icons. I can’t wait for you to get your copy, you can order here.